WHAT IS IT EXACTLY: a concentrated deproteinized calf blood extract with trophic and healing action. Contains nucleotides, nucleozides, glycolipids, oligo-peptides, amino acids, essential microelements, electrolytes and intermediate glucid and lipid metabolism products. Stimulates ATP synthesis through the glucose and oxygen caption growth by special cells in conditions of tissue hypoxia, accelerates regeneration of cut tissues, angiogenesis, revascularisation of ischemic tissues, collagen synthesis and plagues reepitelization. If you are reading this, you probably know what a wonderful product this is. Unfortunately, it is very hard to get for the Western people, but no wonder it is still NO 1 in the ex-Soviet countries’ drugstore sales. – works as a NOOTROPIC – IMPROVE ATHLETIC PERFORMANCE THRU BETTER OXYGEN UTILIZATION and ATP TURNOVER – REJUVENATE THE BODY AND SKIN THRU BETTER COLLAGEN SYNTHESIS AND OXYGENATION OF TISSUES – facilitate healing of BURNS and ULCERS – a tissue respiration stimulating agent – strong ANTI-HYPOXIC effect – improve GLUCOSE METABOLISM and transport = a key for diabetes treatment – anti-ischemia, anti angina – therapy of hemorrhagic shock – myocardiac infarction treatment – cerebral hemorrhage treatment Elementary structure of the medication was investigated. It revealed that such micro- and macro elements as Se, Fe, Mn, Cr, Pb, Sr, Br, Cu, Zn, S, Ca, K, Cl are presented in Solcoseryl. 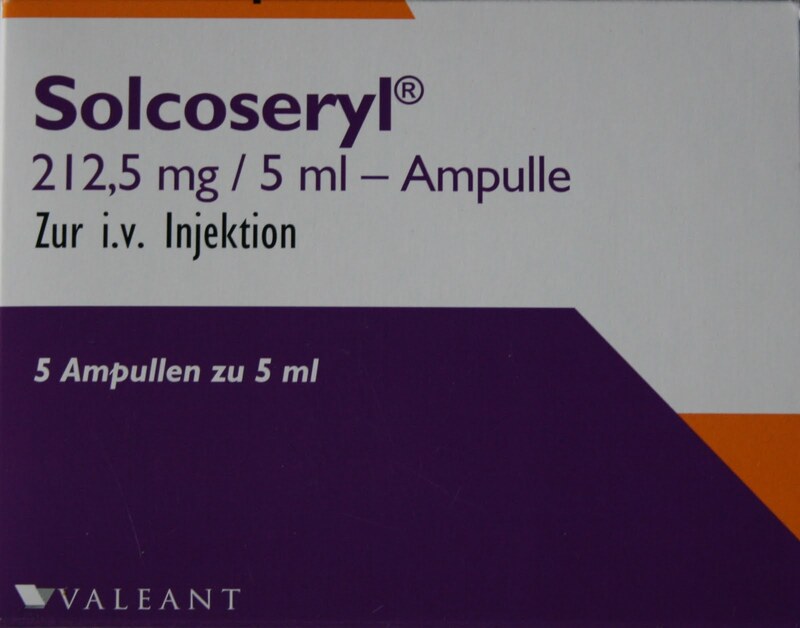 The micro- and macro elements are in a complex with bioligands, which determines a part of Solcoseryl’s pharmacological activity or in other words an influence on homeostasis of the organism. Prescribed for: atherosclerotic or diabetic angiopathy; cerebral, ischemic or haemorrhagic ictus, myocardium infarct, trophic ulcers, decubitus, spread chemical and termic burns. For ophthalmic forms – mechanical, chemical or termic (traumas, combustions) ocular lesions, ulcers and erosions corneic and conjunctival, cornea and conjunctive inflammatory diseases (dry keratoconjunctivitis, keratites, bulous keratitis), irritation produced by contact lenses. For ointment – treatment of trenant plagues. It is applied around the plague and on the newly formed epithelium at its boundaries. If the plague doesn’t ooze anymore it is totally covered with the ointment.